NEW YORK, NY, March 18, 2019 (GLOBE NEWSWIRE) -- via NEWMEDIAWIRE – Tauriga Sciences, Inc. (OTCQB: TAUG) (“Tauriga” or the “Company”), engaged in building its business through the development, distribution, and licensing of proprietary products as well as the evaluation of potential acquisition opportunities and equity investments, today announced that it received an initial $54,000 Tauri-Gum™ purchase order from a major New York City based distribution company (the “Distributor”). This purchase order is for a total of 6,000 individual Tauri-Gum™ blister packs or 600 retail boxes. Within the next few days, the Distributor will send a truck to Tauriga’s fulfillment facility and take possession of the above-mentioned product. The Distributor has a major presence throughout the New York City Metropolitan area (“NYC Metro area”) and generates annual revenue well in excess of $100,000,000. The Company has made the strategic decision to largely focus its ongoing commercial launch on the New York City (“NYC”) retail marketplace. The reasons for this, are that: The Company has excellent NYC distribution relationships and the Company believes that it can launch its brand in NYC in an efficient and cost-effective manner. Besides this $54,000 purchase order, the Company has already received orders through its E-Commerce site (www.taurigum.com), which has been processing transactions since last week. The Company is currently negotiating a comprehensive 12-month distribution agreement with the above-referenced Distributor and believes that it will be successful in consummating this agreement (within the very near term). The Company’s first major corporate goal is to place Tauri-Gum™ in 300-500 select NYC Metro area stores, during the month of April 2019. Should the product prove to be successful in this first phase of its roll-out, the Company will allocate the requisite resources for additional expansion in NYC as well as the Northeastern United States. Tauriga Sciences, Inc. (TAUG) is engaged in building business through the development, distribution, and licensing of proprietary products as well as the evaluation of potential acquisition opportunities. One such opportunity on which the Company has acted, involves the Company having entered into the cannabidiol (or “CBD”) infused chewing gum product business, as more fully described above and in prior press releases. 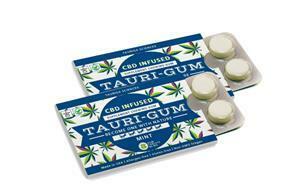 This CBD infused chewing gum product has been branded under the following name: Tauri-GumTM. See also our periodic reports filed by us with the SEC for a more complete description of our business and material agreements that we have entered into. Further, the Company continues to identify and evaluate additional potential opportunities to generate revenue, as well as shareholder value, and leverage its resources and expertise to build a diversified and sustainable business model. Please visit our corporate website at www.tauriga.com. This press release contains certain “forward-looking statements” as defined by the Private Securities Litigation Reform Act of 1995 which represent management’s beliefs and assumptions concerning future events. These forward-looking statements are often indicated by using words such as “may,” “will,” “expects,” “anticipates,” believes, “hopes,” “believes,” or plans, and may include statements regarding corporate objectives as well as the attainment of certain corporate goals and milestones. Forward-looking statements are based on present circumstances and on management’s present beliefs with respect to events that have not occurred, that may not occur, or that may occur with different consequences or timing than those now assumed or anticipated. Actual results may differ materially from those expressed in forward looking statements due to known and unknown risks and uncertainties, such as are not guarantees of general economic and business conditions, the ability to successfully develop and market products, consumer and business consumption habits, the ability to consummate successful acquisition and licensing transactions, fluctuations in exchange rates, and other factors over which Tauriga has little or no control. Many of these risks and uncertainties are discussed in greater detail in the “Risk Factors” section of Tauriga’s Form 10-K and other filings made from time to time with the Securities and Exchange Commission. Such forward-looking statements are made only as of the date of this release, and Tauriga assumes no obligation to update forward-looking statements to reflect subsequent events or circumstances. You should not place undue reliance on these forward-looking statements.